Unsure about the safety of a website? 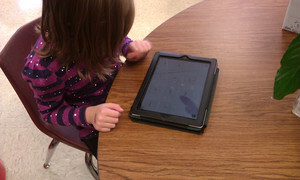 Nervous about the educational value of an app you child wants to download? This page is to provide educators and parents with recommended online learning tools. They have been vetted by Howe staff prior to their placement here. These tools are organized by content area and age level. Dance Mat Typing (website, primary and intermediate): This website is an introduction to touch typing for children aged 7 - 11 years. Each of the 4 levels are divided into 3 stages. Begin at Level 1 and build up your skills gradually through to Level 4. Free Typing Game (website, intermediate): This is a free typing tutor with 30 different typing games progressively teaching the keyboard. They award a printable certificate on completion. Peter's Online Typing Course (website, primary and intermediate): Here you'll find a set of free online typing lessons and typing exercises for beginning typists, and frustrated hunt-and-peckers who want to move from four-finger typing to full-blown touch typing. TapTyping - typing trainer (iOS, primary and intermediate): Master typing on your iPad, iPhone, or iPod Touch. TapTyping is fully compatible with external and Bluetooth keyboards. See a heat map of where you fingers hit the iPad on-screen keyboard and find where you are making your mistakes. Eric Carle's My Very First App (iOS): This fun educational app has three matching games based on Eric Carle’s classic best-selling My Very First Books, designed specifically for the iPhone and iPad. LetterSchool (iOS): An intuitive game to learn all about letters and numbers: writing, counting, phonics and more. Pete the Cat: School Jam (iOS): The bestselling and beloved Pete the Cat series now includes this groovy new app in which kids can play a fun hidden object game as Pete travels through his school looking for his guitar. TeachMe: Kindergarten (iOS): TeachMe: Kindergarten is an educational iPhone/iPad/iPod touch app which teaches four different age appropriate subjects to Kindergarten aged children: sight words, addition, subtraction and spelling. Toontastic (iOS): Lights, Camera, Play! Toontastic is a storytelling and creative learning tool that enables kids to draw, animate, and share their own cartoons with friends and family around the world through simple and fun imaginative play! Bugs and Numbers (iOS, primary and intermediate): Bugs and Numbers provides an extensive collection of unique games dedicated to learning and practicing a wide range of math skills in a non-traditional way. Organized into three basic stages, the app grows with your child through 18 games ranging from basic counting to early fractions. Marble Math (iOS, intermediate): Solve a variety of math problems by collecting numbers as you roll or drag your marble through a series of fun mazes for ages 9-12 and up. Marble Math Jr. (iOS, primary): Solve a variety of math problems by collecting numbers as you roll or drag your marble through a series of fun mazes for ages 5-8 (with audio questions for emerging readers). Math Ninja HD (iOS, intermediate): Use your math skills to defend your tree house against a hungry tomato and his robotic army in this fun action packed game! Choose between ninja stars, smoke bombs, or ninja magic - and choose your upgrades wisely! Native Numbers (iOS, primary and intermediate): This app is designed for early elementary and can be used for RtI. It covers number sense skills from 1-9 ONLY. It is adaptive and mastery based and has accompanying teacher or parent dashboard. Park Math (iOS, primary): Come play at the park, and learn to count, add, subtract, sort and more! Park Math introduces early math concepts to children in Preschool and Kindergarten (ages 1-6). Bats! Furry Fliers of the Night (iOS, primary and intermediate): Written by Mary Kay Carson and created for the iPad by other experts in nonfiction for children. Bats! is a true innovation in children’s publishing. It is an original nonfiction book and a new kind of reading adventure for children. Loud Crow Interactive (iOS, primary and intermediate): Carefully crafted award-winning interactive books apps that capture the fun and nostalgia of story time. Stories have professional narration. Oceanhouse Media (iOS, primary): To promote reading in young children, choose from dozens of authentic digital books such as Dr. Seuss and Little Critter. Individual words are highlighted as the story is read. By combining the original text and artwork of the book with features that entertain and promote reading, these omBooks appeal to readers of all ages. Online Storytime by Barnes and Noble (website, primary): Stories read aloud online by the authors and celebrities. We Give Books (website, primary and intermediate): A new digital initiative that enables anyone with access to the Internet to put books in the hands of children who don't have them, simply by reading them online. Reading Mathematics Writing Vocabulary Science History Art Geography Current Events Music Physical Education Hobbies and Interests Use your Ctrl & Shift keys to select multiples. Primary Intermediate Use your Ctrl & Shift keys to select multiples. Why are you recommending this app/website?